This color remake of Alfred Hitchcock’s 1960 black and white classic closely follows the plot of the original. Marion Crane is killed in the shower of the Bates Motel, and Normal Bates is acting very suspicious. Viggo Mortensen plays Sam Loomis, Crane’s boyfriend. 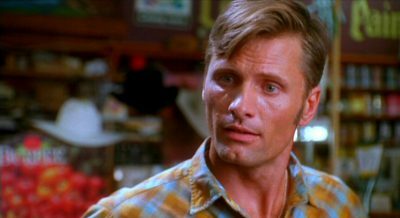 My favorite recasting is pre-Lord of the Rings Viggo Mortensen, replacing John Gavin as Marion’s boyfriend, Sam Loomis. He seems like a good guy, content in his low-wage life at the hardware store but stand-up enough to take action when his girlfriend is in trouble. Mortensen also is manly enough to intimidate Norman, who he suspects stole Marion’s money; that’s essential given Vaughn’s larger stature (and the impossibility of matching [Anthony] Perkins’ nervous chewing and tapping in that scene). Danny Elfman & others reproduced the original 1960 Psycho soundtrack.